I’m ready for a burst of citrus. Not orange – I’ve had plenty of that over Christmas – but lemon. The Christmas cake is almost finished; the yule log is long gone and we have no stash of Christmas biscuits. In fact with teenagers in the house we have no stash of anything. 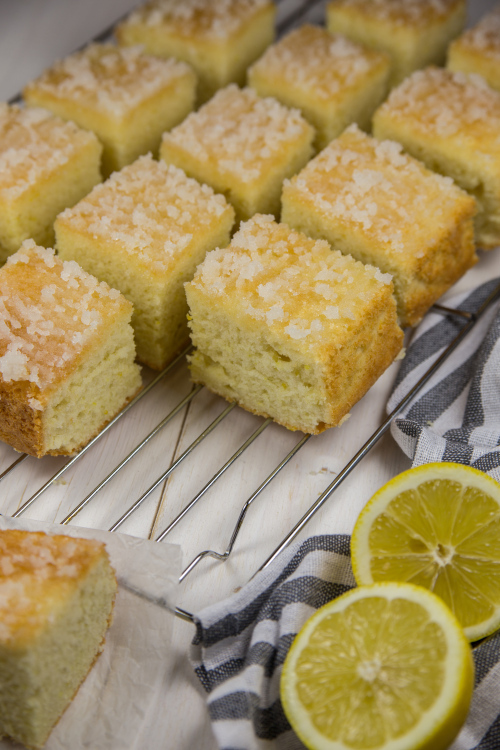 So a simple lemon drizzle it is. I’ve abandoned loaf cakes, round cakes and all fancy-pants cakes. They don’t last long enough and someone in the house has a penchant for cutting a cake from both ends, much to the chagrin of his siblings! So traybakes are my cake of choice. I could have pimped this up with poppy seeds or limoncello but in January I want simple and unadulterated. Don’t for one minute think this is in any way worthy. There’s a whole heap of sugar in it and on it ‌‌but a small piece from time to time does you good. I stick (more or less) to St Mary Berry’s recipe.